Zion Market Research has published a new report titled “Healthcare Augmented & Virtual Reality Market by Product Type (Augmented Reality and Virtual Reality), by Technology (Augmented Reality and Virtual Reality), and by End-User (Hospitals and Clinics, Research Laboratories, and Others): Global Industry Perspective, Comprehensive Analysis, and Forecast, 2018–2025”. According to the report, the global healthcare augmented & virtual reality market was valued at approximately USD 850 million in 2018 and is expected to generate around USD 5,115 million by 2025, at a CAGR of around 29.2% between 2019 and 2025. Augmented reality (AR) is an improved form of realism where live indirect or direct views of physical real-world surroundings/environments are amplified with superimposed CGI or computer generated images over an operator’s view of the actual real world, thus augmenting the current perception of realism. On the other hand, Virtual reality (VR) creates a completely different world. Virtual reality is majorly adopted in the healthcare domain that involves robotic surgery phobia treatment, surgery simulation, and skills training. Virtual reality in medical training has the facility to transport medical experts inside the human body to view and access zones, which otherwise would not be accessible. In medical treatment, VR plays an important role in patient education, robotic surgery, mental health and psychological therapy, and pain management and physical therapy. The high demand to decrease various healthcare complexities and technological advancements are anticipated to propel the growth of the healthcare augmented & virtual reality market in the future. The growing workload of healthcare professionals and inflexible regulatory compliances in laboratory testing and clinical trials are boosting the demand for well-equipped healthcare infrastructure with IT solutions. The healthcare augmented & virtual reality market is segmented into product type, technology, and end-user. Based on product type, the market includes augmented reality and virtual reality. The augmented reality product segment is sub-segmented into AR displays, AR sensors, AR input devices, AR semiconductor components, and others. The virtual reality segment is sub-segmented into VR displays, VR sensors, and others. The augmented reality segment accounted for the major share in the global healthcare augmented & virtual reality market in 2018, owing to the AR’s ability to seamlessly blend direct sensory experience of the real world with all the power and potential of digital information technology. 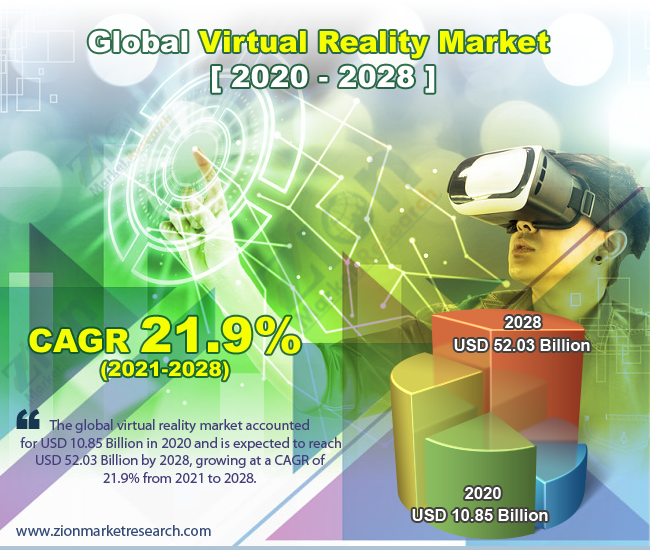 The VR segment is anticipated to register a higher CAGR in the future, owing to the wide range of VR applications in the healthcare sector and adoption of newer technologies. By technology, the market includes augmented reality and virtual reality. The augmented reality technology segment is classified into head-mounted and handheld. The handheld segment dominated the market in terms of revenue in 2018. The virtual reality technology segment is segmented into head-mounted, gesture-tracking, and projector and display walls. The gesture-tracking sub-segment is anticipated to register the highest CAGR in the global healthcare augmented & virtual reality market, owing to the ease of adoption due to low technical complexity for the end-users. By end-user, the healthcare augmented & virtual reality market includes hospitals and clinics, research laboratories, and others. Hospitals and clinics are estimated to dominate the global healthcare augmented & virtual reality market over the forecast time period. By region, the North American healthcare augmented & virtual reality market is estimated to dominate over the forecast time period. This can be attributed to the high prevalence of diseases and the adoption of advanced and digital technologies. Europe was also a major market in 2018 for healthcare augmented & virtual reality market globally. The Asia Pacific healthcare augmented & virtual reality market is estimated to show at the highest CAGR in the upcoming years, owing to the increasing burden of chronic diseases, rising population, growing awareness, and favorable government initiatives. The Latin American and the Middle Eastern and African markets are slated to experience moderate growth in the years to come. Some key players of the global healthcare augmented & virtual reality market are Vuzix, Qualcomm Incorporated, Augmented Pixels, Inc., Koninklijke Philips NV, CAE HEALTHCARE, Layar, Intuitive Surgical, 3D Systems, Inc., Hologic, Inc., and GE Healthcare among others.